GraceConnect » Pope Visits C.A.R. 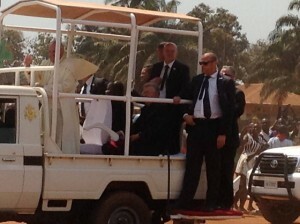 Pope Francis visits the Central African Republic. The eyes of the world are on the Central African Republic this week as Pope Francis makes his first visit to this war-torn country. Dr. Augustin Hibaile, a key Grace Brethren leader in the country, reported: “…We pray for God’s miracle in the hearts of our people to bring peace in CAR. Lot of people on the streets to welcome the Pope. “Among his visits, he will speak to the Catholics just after his audience with the President of the country, than he will speak to the Protestants at the Bangui Evangelical School of Theology. Dr. Hibaile’s photos and report was posted on Facebook and shared here with permission. The Central African Republic is the home to several thousand Grace Brethren congregations. Below is a portion of a report on the Pope’s visit from the BBC. Click here to read the complete article. Pope Francis has called for peace and reconciliation in the deeply divided Central African Republic, on the latest leg of his African tour. 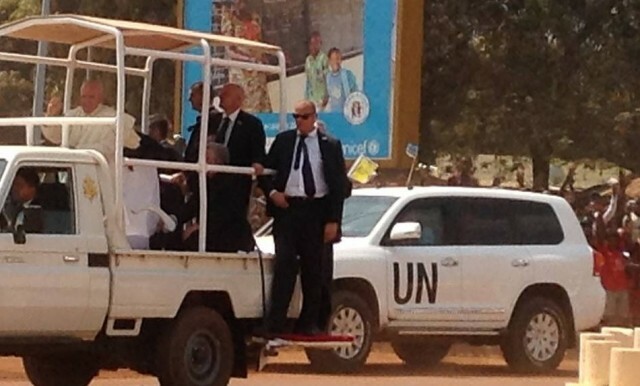 Security was tight for what is the pontiff’s first trip to a conflict zone. He stopped at a refugee camp and said Mass at the cathedral, before Monday’s visit to a mosque. Religious affairs correspondent Caroline Wyatt reports from Bangui.